To specify set command parameters, first, please select the batch in the corresponding batch list. You will see its properties in the right pane of the dialog. Select a Tag Type to write values to the PLC. Tag – you can write the tag straight into the Tag field; you can also click on the ‘…’ button to prompt the tag database. Connection – set connection to the PLC. Connection parameter is same for all set commands in the batch. Title – Set title for this set command. If you require a response from the user in the form of dialog, the title of the dialog will be this title. Use translation button to provide a translation for this set command. Lock Enable – check this option if you want to use On Touch Lock for this element. Log – check this check box to log this user action. The user action will be logged with the provided message. 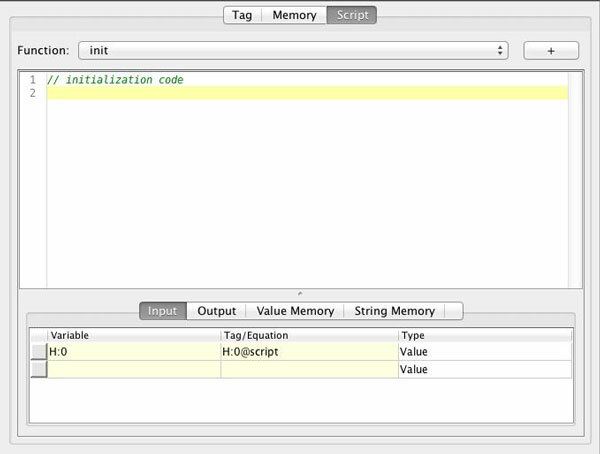 Select a Memory Type to set View Script Variables. Variable – specify a View Script variable to set the value to. Log – set this check box to log this user action. The user action will be logged with the provided message. Connection – set connection to the database. Connection parameters are the same for all set commands in the batch. SQL – specify SQL that will be used to write values to the PLC. The SQL parameter is the same for all set commands in the batch. When the batch is processed, all values from the batch are inserted into the specified SQL. The top set command in the batch will replace #1# keyword in the SQL; the second set command in the batch will replace #2# keyword, and so on. The following example will explain how to write multiple values into the SQL database with one batch set command. We will ask the user to enter two values which will be then written to the database using the SQL command. b. Create a connection to your database. 2. 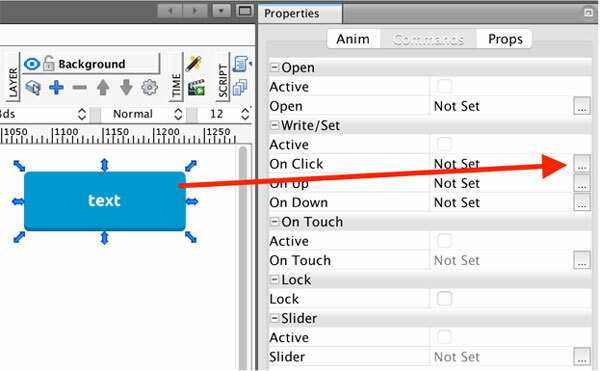 In your view, navigate to the button element and in Properties -> Commands, select Write/Set Command. 4. Now test your project. If you click on the button, the user will be asked twice to enter the value. Once the user has entered both values, mySCADA will execute the SQL. #1# will be replaced with the first value; #2# will be replaced with the second value. 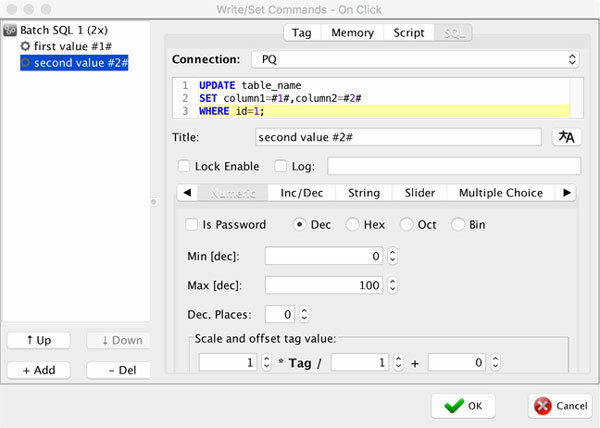 This very useful feature allows you to oversee, set up, and enrich the whole Write/Set command functionality from the scripting level (i.e. you can freely create and add your own new arbitrary functionalities). When the set command is processed, the corresponding View Script is called. For a detailed description of how View Scripts work, please see section View Scripts.